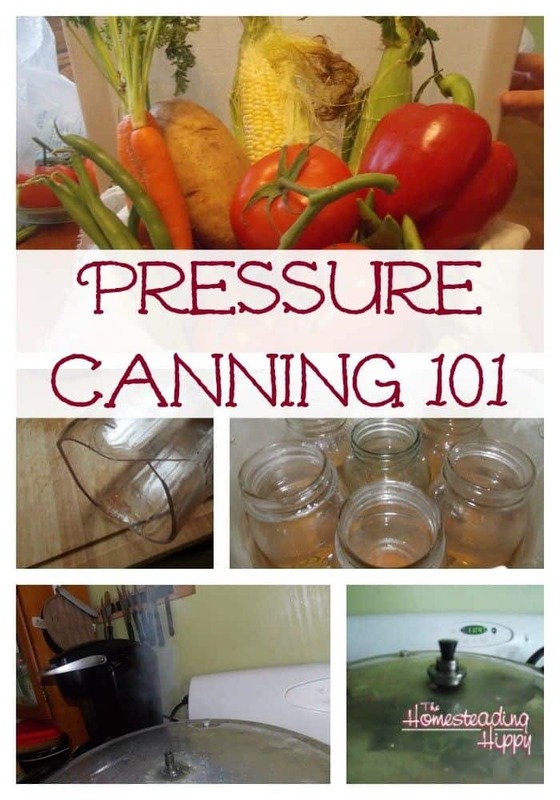 Simple tips to help you learn to use your pressure canner and can with confidence. 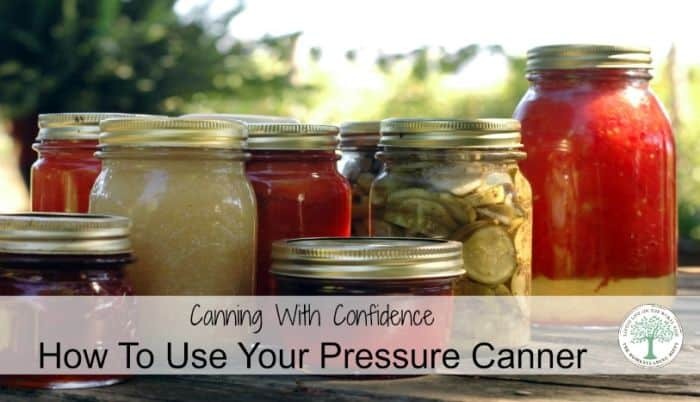 Learning how to preserve your garden bounty by pressure canning isn’t hard at all. When your garden is overflowing, you want a way to preserve all your vegetables. You can dehydrate or freeze them for later, but what other options do you have? What if your freezer is full, or you don’t have the extra space to begin with? Pressure canning your low acid vegetables such as corn, potatoes, green beans, and peas are a great way to preserve your harvest! In order to can low acid veggies, you MUST use a pressure canner. No amount of time in a water bath canner will safely can these. Some people are worried that it may blow up, or other issues happening, but let me reassure you that isn’t common. It takes a bit of practice and planning ahead, but once you get the hang of it, using your pressure canner will be easy. A pressure canner. Low acid vegetables are NOT safe in a water bath canner. Look for them in thrift stores, garage sales or estate sales. If you find a used one you want to buy, be sure to look for holes in the metal, and that the pressure canner lid ring is intact. Older models may NOT have replacement rings available. Glass canning jars. They come in many different sizes such as quart, pint, half-pint, and 1 ½ pint size (also called bologna jars) in both wide mouth and narrow mouth openings. Once again, look at yard sales or thrift stores. Be on the lookout for cracks in the jar or on the lid itself. Buying new jars is often considered an investment as they can be used over and over again. Half-pint size jars are perfect for jams, jellies, and salsa. These are commonly not pressure canned due to the softness of the food, however. Meats, soups, and beans can go into the pint sized jars or even the bologna jars. Quart sized are great for fruits and veggies. To see more about reusing glass jars from store bought products, read the post here. New lids. If you are using the commonly found metal lids, you will need new ones each time you can. Reusing lids may not be safe as the seal may not be “true” and your food will grow bacteria that you can’t see. Hard plastic lids, like Tattler, are another investment as they are reusable. Clean jar bands. Bands CAN be reused over and over for canning, as long as they maintain their shape. If they become bent or out of circular shape, they should not be used for canning as they may not seal as well. Bands are sold with new jars, or with new lids as well. Just remember to wash and dry the bands before storing to help avoid rust issues. After the canning process, you keep the bands in place until the jar has completely cooled and had a chance to seal. You will then want to remove the bands. Storing jars with bands in place can lead to a false seal, where the lid comes up on it’s own and appears to re-seal. Inspect your equipment to ensure it’s in proper working order. Gather jars, lids and bands. If you have a dishwasher, you can run the jars and leave it on a “hot dry” cycle to keep them hot and to clean and sterilize them. Knives that you will use for cutting food need to be sharpened and cleaned. A sharp knife will reduce the chance of slippage and getting hurt as it will take less to cut through the food. Cutting boards should be cleaned and sprayed with vinegar to sterilize them as well. This will lessen bacteria getting into your canned foods. Use a TESTED recipe for the foods you are canning. Cut your food up into as equal size pieces as possible, to keep the canning times even in the jars. Start the “clock” on the processing time when the water in the water canner is BACK to a full rolling boil or the pressure canner has reached the FULL pressure, either by the gauge or the rocker has started rocking. Always allow the pressure canner to cool on it’s own. NEVER run water over it or lay cold towels on it. This can cause jars to break inside, or even cause you to get burned. It only takes about 20 minutes to cool, so you can be preparing another canner load of food while you are waiting. Canned food DOES have a shelf life. 12 months is usually the recommended time for storing foods. After that, the food can lose nutrients, or not taste as fresh. I have seen people store their foods for up to 5 years before eating, but it’s best to use it within 12 months. Enjoy your new skills in pressure canning, and being safe canning low acid veggies! You’ll feel great when you can feed your family food you grew and saved yourself! What are you looking forward to pressure canning this year? When you use your pressure canner, there are two types of techniques used, raw pack and hot pack. They are just what they sound like; raw pack is when you put the food in the jar raw and cover with boiling liquid, and hot pack is when you partially cook the food before you pack it in the jar and cover with boiling liquid. The main advantage I have found with using the raw pack method is that it takes less time. You clean your food, cut into the right sized pieces, pack in, and cover with boiling liquid. Bring up to pressure, time, and you are done! Viola! Easy, peasy! You will hear the term “headspace” quite often and may wonder what that is. That is the air space left between the food and the lid of the jar. The screw rings on the top of the jar are pretty good eyeing indicators. The bottom one is an inch from the top, the middle ½ inch, and the top ¼ inch. Please remember that pressure canning your low acid veggies is the ONLY safe way to preserve them. Water bathing at 212 degrees is NOT high enough of a temperature to kill off all bacteria. One exception to this rule is tomatoes. Water bath canning tomatoes CAN be safe, if you add a bit of acid to them, such as lemon juice. How often do you use your pressure canner? What are your favorite veggies to preserve? What a great tutorial for canning beginners! I am going to share your post on my post about Home Canning Supplies it will be a perfect resource. http://oursimplelife-sc.com/home-canning-supplies/ Thanks for sharing! These are great tips! Thanks for explaining everything. This will come in handy for my pressure canning adventures!